In November 1908, the Club was struggling with just 38 members who were on the verge of abandoning the project. Gamper was determined to keep the Club afloat and for the first time he became president of the organisation. This marked a new stage in the Club's history, which consolidated it within the football panorama and social milieu of the city and country. A number of different circumstances played a part in this process, including its strengthening as an organisation via the steady growth of its members; the re-writing of the Club statutes, and the acquisition of the Club's own football grounds for the first time. At the same time, a range of sporting successes and growing recognition accorded to players saw football develop into a mass phenomenon, turning it into a professional sport. The Club grew rapidly. The number of members increased from 201 in 1909 to 2,973 in less than ten years. During these years, Barça laid down solid foundations in order to define the type of football club it wanted to be. This took it beyond the original dream of the group of friends that had founded it in 1899; the Club was here to stay. The ground at Carrer Indústria (today Carrer París) was inaugurated on 14 March 1909 and was the Club's home until 1922. In 1916 a two-tier stand was erected, the first of its kind in a Spanish football grounds; this increased the stadium capacity to 6,000 spectators. Barça fans associate these football grounds with the origin of the nickname “culers” (literally “arse-people”), used to refer to supporters of FC Barcelona. Far from being offensive, the name refers to fans seated in the highest row of the stadium. From outside, people who passed by could only see their backsides. During four seasons from 1909 to 1913, the Club won three Spanish Championship (also known as the Copa del Rey) and four Pyrenees Cups, which was the first international tournament that Barça played in. Teams from Catalonia, the Basque Country and the south of France played in this competition. The team’s success led to membership growth and compelled the fans to turn out to welcome the team home after a victory. The players who beat Madrid in the Spanish Championship in 1910 received a hero’s welcome at Passeig de Gràcia station, with the crowd following them to the building where the celebration dinner was held. From 1909 the Canaletes drinks stand, in the centre of Barcelona, became the place where football results were announced. Fans have congregated here ever since to celebrate Barça’s successes. The Club held a competition to choose a new design; the result, with slight modifications, is the badge we know today, and was designed by Santiago Femenia. The design is representative of the Club’s identity. It features the St. George’s Cross and the four stripes of the Senyera, the Catalan flag. The Club’s colours, blue and claret, also appear with a football in the centre. Paulino Alcántara, from the Philippines, played his debut season in 1911-12, aged just fifteen. He is, without doubt, Barça’s first star player and the Club’s top goalscorer until the arrival of Leo Messi. He scored a staggering 369 goals in 357 matches, representing an impressive average of one goal per match. It is said that his kick was so powerful it could rip through the goal net. Alcántara always wore a white scarf tied round his waist. 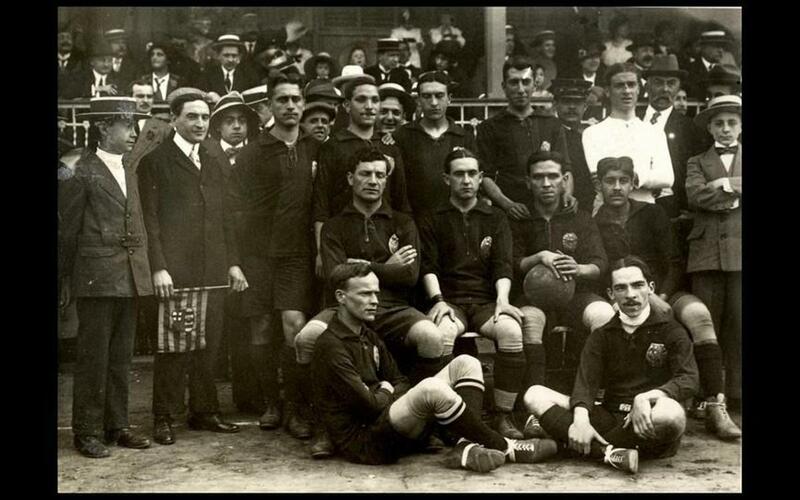 The 1908-1909 season marked the beginning of FC Barcelona’s dominance in the Catalan Football Championships. By 1919, Barça had won the title five times, with the highlight coming in 1909/10 when the team won all their matches.